Gordon Malloy was a good, tough football player who became a great player his senior season, 1954. That Hurricane team finished the year with 8 wins against a lone loss at #6 Auburn, ranked 9th, with wins over 5 ranked teams, including Alabama, Florida, Maryland and Mississippi State. The 1954 team was regarded one of the greatest teams in Hurricane history to that point and Gordon Malloy was captain of that team. Malloy, hailing from Atlanta, Ga., played both halfback and fullback on offense and played cornerback, safety and some linebacker on defense. 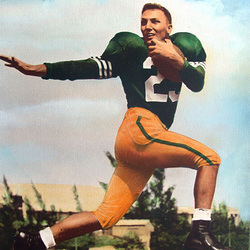 He led the team in rushing in both 1953 and 1954. As a senior, Malloy lead the team in rushing with a 4.6 yards per carry average. He also caught seven passes, one for a touchdown. As a senior he emerged as one of the most sensational punt returners in UM history. His 223 yards in nine punt returns still ranks in the returns per yard category. Malloy scored seven touchdowns his senior year and twelve in his career and he was among the leaders in tackles during his three years on the varsity squad. He was drafted by the Detroit Lions in the 1955 with the 39th pick in the draft (4th round), ahead of future NFL Hall of Fame great Johnny Unitas (102nd pick). Gordon was tapped into the Iron Arrow Society, the highest honor one can attain at the University of Miami. He was been active in the Atlanta Area UM Alumni Association.